Kobi Blocks Walnut End Grain Butcher Block Wood Cutting Board 12" x 18" x 1.5"
Upgrade your kitchen by adding a custom made Kobi Butcher Block Cutting Board. Easily one of our most popular blocks, you can't go wrong with this old world styling and rustic charm. Manufacturing Process:All the wood used to carefully craft each block is homegrown from "green" forests here in America where all trees are immediately replanted after being cut. All Kobi Blocks are manufactured with precision machinery using all natural products to balance making your board unique, while maintaining the highest standards in each step of our planing, ripping, cutting, adhesion, measuring, routing, sanding and oiling processes. Design:We strive to bring an artistic quality to every board we make so your piece can seamlessly fit in as a contemporary, yet rustic, homey and warm piece of home decor when not in use. Usage:Is there a special occasion coming up in your life? Kobi Blocks make the perfect gift for Mother's or Father's day, Valentine's Day, Birthdays, Anniversaries, Weddings, Christmas, Hanukkah, Housewarming gifts and many other traditional occasions. Other sites can take weeks to get your board out; whereas we can get it to you in days! Every board is soaked with a generous coating of FDA approved food safe mineral oil. Since our boards are made from all natural healthy wood products, and not from chemically plagued plastic products, Kobi boards require minimal, but needed maintenance to help keep your board in good condition. We offer a wide variety of affordable oiling, cleaning and conditioning products in addition to an easy to follow "Do's and Don'ts" maintenance guide that comes complimentary with every piece. Our Promise:We stand behind each and every Kobi Block we sell, in hopes that your Kobi Block will be a part of your family and home for generations. And of course, best of all; ALL Kobi Blocks are 100% MADE IN THE USA! If you have any questions about this product by Kobi Blocks, contact us by completing and submitting the form below. If you are looking for a specif part number, please include it with your message. 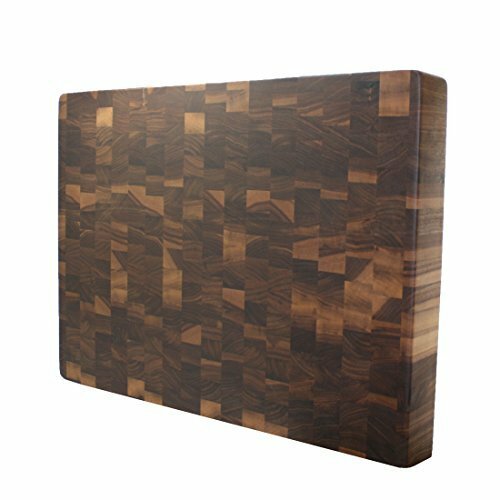 Top Chop Butcher Block Premium Reversible End Grain Cutting Board, Maple, 16" x 18" x 2"
Walnut Cutting Board, Edge Grain, Reversible, Hardwood Chopping and Carving Countertop, Carved Inset Handles, by Pacific Wood. Handmade In the USA 14 x 20 x 1 IN. John Boos CHYKCT-BL3627-V Blended Cherry Counter Top with Varnique Finish, 1.5" Thickness, 36" x 27"
Kobi Blocks Walnut End Grain Butcher Block Wood Cutting Board 18" x 24" x 1.5"
BigWood Boards W110-N Cutting Board, Monogrammed Cutting Board, Medium Round Cheese Board, Thick Walnut Wood Serving Tray, "N"
Kobi Blocks Walnut Edge Grain Butcher Block Wood Cutting Board 20" x 24" x 1.5"
Kobi Blocks Walnut Edge Grain Butcher Block Wood Cutting Board 20" x 24" x 1"